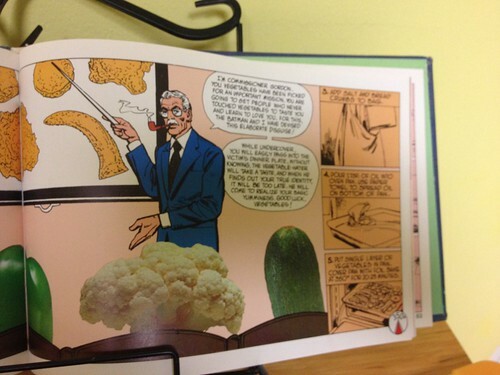 Early in the days of this blog, I wrote a post about the DC Super Heroes Super Healthy Cookbook (DSHSHC), a slightly strange 1981 off-shoot of the DC marketing juggernaut. The post, about Batman's dubious attempt at french toast, was popular enough that I wanted to do a sequel, but there needed to be a twist, something to draw you all back in. 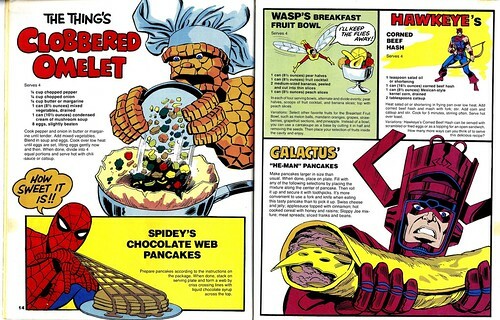 See, Marvel also has a cookbook, one that slightly predates the DC one, in fact - Stan Lee Presents: The Mighty Marvel Superheroes Cookbook (MMSC). This book doesn't have a spin on health, like the DCE one. Instead it seems more geared toward recipes kids would make with parental supervision. This means easy recipes with a lot of pre-prepared ingredients (read: canned stuff). I thought it would be fun to put these recipes head to head. Tiny Doom graciously offered to represent Marvel in this contest - we couldn't afford a copy of the book, (which goes for an average of $100!) but the good folks at ScansDaily provided us with enough material to make it work. So join us, won't you, for a two-part battle royale to determine whether DC or Marvel reigns supreme - in the kitchen. The ground rules were that we had to follow the directions exactly - no "improving" the recipes with better techniques or ingredients. That said, as you'll see, there were times I had to interpret instructions, mostly due to missing steps or clarity errors. Tiny Doom's husband The Goog joined us as "The Watcher" in order to break any ties, and because if we were going to suffer, so was he. Mr. Menace had other plans, but we still managed to force him to consume some of this nonsense, as you'll hear about in Round 2. I picked this recipe for a couple of reasons. 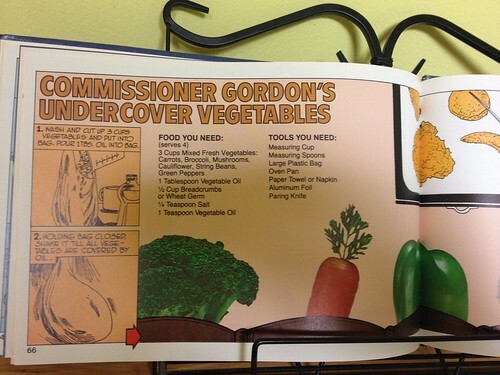 One, I was totally enchanted with the ludicrous accompanying illustration, in which Jim Gordon is giving a bunch of veggies their marching orders - an undercover op to trick veggie-haters into consuming them. I'm not sure why the vegetables are down with this. I guess they exist to be eaten? The whole thing gets mega-creepy pretty quickly if you think about it for too long. The second reason I selected this was that in my previous post, I mentioned an obsession with wheat germ runs through this book. This recipe is a good showcase for that obsession. 1. 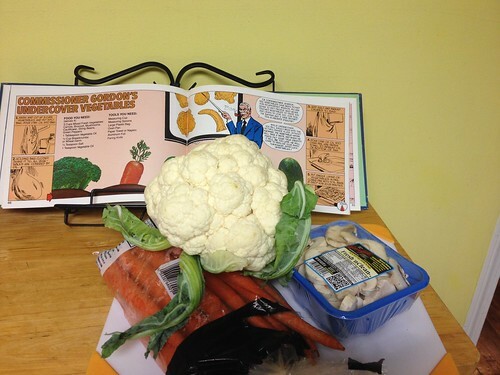 Hmm, it tells me to cut up the veggies, but not how. Should they be in big chunks? Julienned? 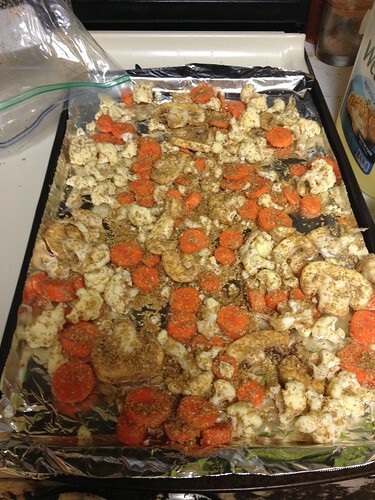 I decided to make fairly small cauliflower florets, carrot coins, and to leave the mushrooms as they came, pre-sliced. 2. 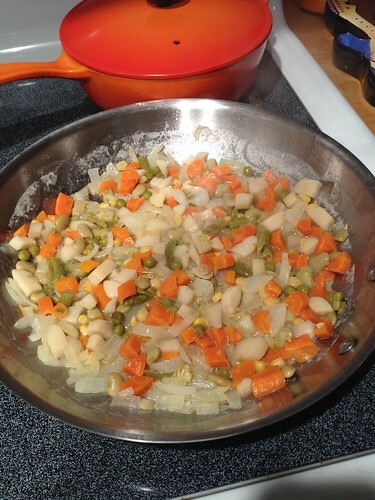 A thing you might not realize is that three cups of mixed veggies is not a lot of any one vegetable. I think I only used about a quarter of the cauliflower. This was probably for the best. 3. There's an instruction to add the salt and wheat germ, but no instruction to shake the bag after you do so. Since this is a cookbook for kids, that kind of makes me crazy, but I assumed it needed to be done and did it. 4. Hmm. 350°F for 20-25 minutes seems like an insufficient time to get these vegetables cooked, even with this foil tent that I'm supposed to put over them. Said tent raises its own concerns - when I first saw this recipe I figured it was a sort of baked tempura - veggies with a crispy coating. But how can the coating get crispy under this foil blanket? Oh well, I guess we'll find out together. 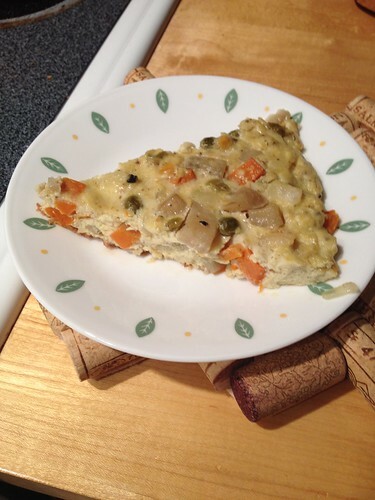 If you want to get technical this is more of a frittata than a traditional folded omelet. I have no idea why it looks like it exploded in the above picture. I think maybe it’s also supposed to mirror a quiche (if the mirror was shattered on the sidewalk into a thousand pieces). 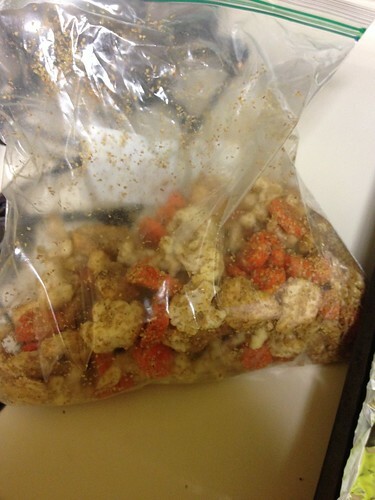 The recipe is low on seasoning and high on canned ingredients, which do supply plenty of salt and "can" flavor. Admitted, that's part of what made me want to try it, it was just so 70's. The prep isn't overly complicated. 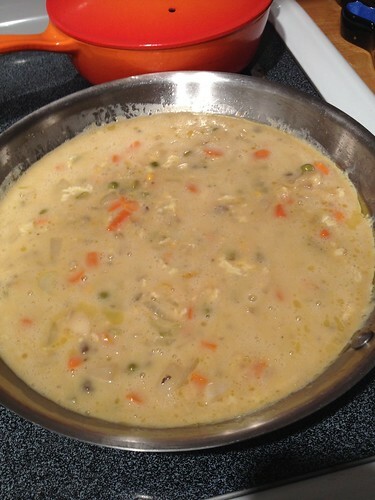 Melt butter, cook onion (I did not add pepper due to allergies), add canned veg. Then...the step that really made me shudder, combining canned cream of mushroom soup with the eggs. Not sure what the point of this is, can't we just add real mushrooms and some cream? Please!? Nope! Apparently this is how they roll on Yancy Street. The directions say to cook over low heat, gently lifting eggs now and then...and I did this, but I felt like the egg still wasn't setting to a point where I felt comfortable feeding it to people I like. (Why am I feeding this to people I like at all???) So I finished it in a 350 degree oven for about 10 min. I am guessing this looks like it's supposed to? I used a pretty large pan here, there were 8 eggs after all, and the directions say to cut this into 4 pieces. I am opting for 8 pieces instead, we have a lot of tasting ahead of us tonight and I'm not sure anyone should be choking down a full quarter of this in one sitting. The Red Menace: As predicted, the vegetables were completely undercooked, with the possible exception of the mushrooms. And guess what - when you steam wheat germ, it apparently puffs up, turning into a bizarre soft, pillowy coating that expands in your mouth, until all you can taste is wheat germ and despair. These vegetables aren't fooling anyone, and if you gave them to a veggie-hater he or she would probably punch you right in the nose. Tiny Doom- I think the recipe is the culprit for making this so tough. There is no way the vegetables would have cooked though at the time and temp in the recipe, no matter what vegetable you used. Plus, covering them keeps the wheat germ from toasting. Instead, it steams into a wet germy covering. 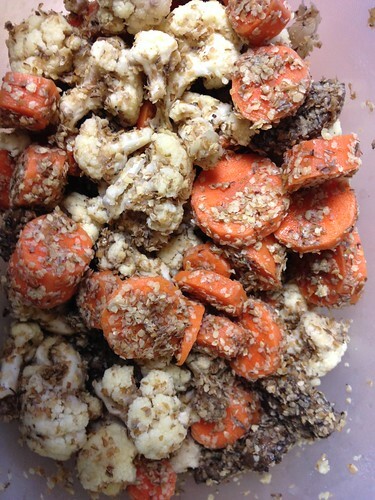 So if you like raw veggies and soggy wheat germ, this is the dish for you! Part of keeping it healthy might be that there is only a tiny bit of salt in this recipe...but it’s not doing it any favors (or flavors *rimshot). Sriracha got used here too. Goog on the Veggies: The veggies were under cooked, practically raw, and the germ was soft. Overall it was fairly unpleasant, but not beyond saving. Had the book called for the veggies to be roasted to completion and the wheat germ maybe crisped up, they could have been pretty good, depending on your opinions on wheat germ. TRM - When I first saw this, I felt fear. Fear that I would try to put it in my mouth and my body would just straight up reject it, which would be a dinner-party faux pas. Luckily, it wasn't quite as horrible as I thought it would be. However, it wasn't what I'd call "good." As TD notes, it was incredibly salty and yet bland - the only other flavor I could identify was a faint tang of can from the vegetables, a weird metallic note. 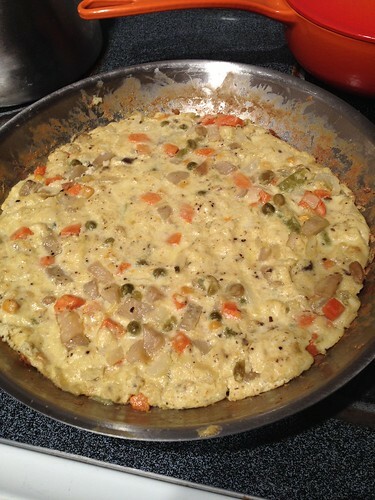 Also, I am pretty sure there were some kind of beans in the vegetable melange, which is just wrong in an omelet. Rating: I'll give it one whole batarang, for being less awful than I thought it would be. Still, nothing edible should ever be that color. The Goog on the Omelet- I certainly didn't hate this, but it did have a weird consistency. It would have benefited from more cooking time and less squishy ingredients, maybe just mushrooms, and no "cream of." ROUND 1 DECISION GOES TO MARVEL! But barely. And really, the vegetables were less unappealing, but could not win a cooking contest since they were still mostly raw. STAY TUNED FOR NEXT WEEK'S BATTLE FEATURING MAIN DISHES!